Fertilizing your turfgrass may not be rocket science, but there’s more to it than you might think. If your grass isn’t performing to your expectations, you may need to alter your feeding methods. Working closely with the University of Florida, we offer the following general recommendations for fertilizing your Florida lawn. The topsoil under any lawn usually dictates the nutritional needs of the covering turf. As grass reacts to the acidity or alkalinity of the dirt as well as, sand, clay and organic material, knowing the composition of the substrate will help determine how to effectively fertilize. Performing a soil test at least once should illuminate the basic feeding requirements for your lawn. You can accomplish the soil test by contacting the University of Florida’s extension office in your county. Start the process with their interactive map found here. With or without a soil test as a guide, you can get a good idea of what your lawn needs to thrive by knowing its species. The most common warm-season turfgrasses in Florida include St. Augustine, Zoysia, Bahia, Bermuda, and Centipede. Because most sod grasses require N-nitrogen, P-phosphorus and K-potassium, fertilizer products label the concentration of these three vital macronutrients according to their percentages. The bag usually offers a chart on how much to use per lawn size. Keep in mind that the first number is for nitrogen, the second for phosphorus and the third for potassium. Thus, a bag might say it has a 15-0-15 mix, meaning 15 percent nitrogen, no phosphorus and 15 percent potassium. The rest of the product usually comprises a variety of micronutrients and/or inert materials that bind the top three macronutrients for easy distribution. 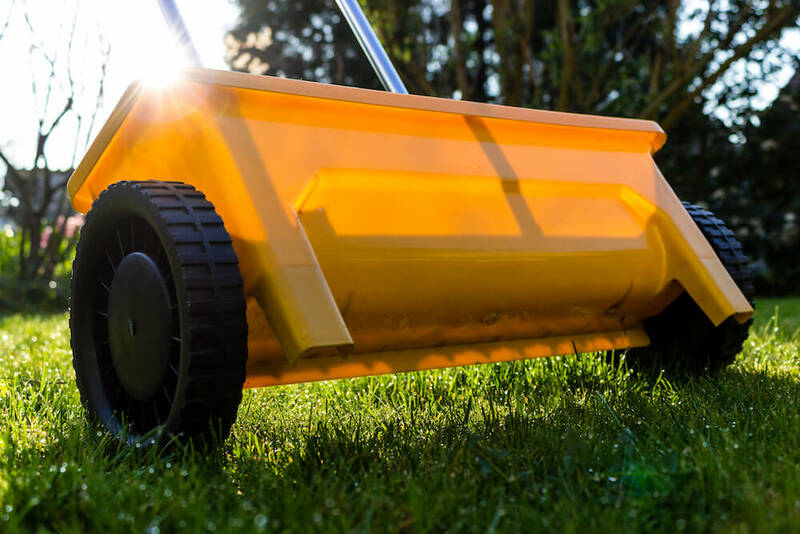 No matter your lawn type, the best formulas use slow-release nitrogen to avoid sudden bursts of growth and to allow the nitrogen to work consistently over the course of a season. If you use bags of dry fertilizer, be sure to apply properly. Not only do you want even distribution over the lawn, you also want to avoid sending overspread into the waterways or aquifers. The best methods call for either a drop spreader or a rotary spreader with a diverter for the edges of the lawn. A drop spreader allows gravity to pull the grains straight down for easy control. Rotary spreaders broadcast the grains, and without a diverter will do so indiscriminately. Rather than hose off overspread on paved areas, which can end up in storm drains and stain your concrete, sweep it up and dispose on the lawn. Application of dry fertilizers require watering in soon after. The idea is to move the nutrients below the surface of the dirt for the roots to grab. Usually, a quarter of an inch of water will suffice. More, and you may inadvertently wash the nutrients past the roots which do them no good. Remember, watering in fertilizer isn’t necessarily intended to be an irrigation event. If you live in a zone where the grass goes dormant for winter, wait until it begins to green up before applying a nitrogen fertilizer. Be sparing with fertilizer during the summer months when the turf is in peak production. Rather, apply full amounts in fall before dormancy and in spring when the sod is waking up. Effective fertilization works hand-in-hand with a good irrigation and mowing program to create a healthy, robust carpet of green. The more vibrant the turf, the more easily it rebuffs insects, fungi, foot traffic damage and other enemies of lawns. Start with a soil test, determine your cultivar, fertilize according to real needs and take care of the environment at the same time. If you have any questions, please feel free to contact us for professional help.